Dot Tuer (1998). The Second Nature of Simulation. Long after unstrapping the harness and shedding the helmet that immersed my body in Char Davies's Ephémère, I retain a memory of her computer rendered environment that is absolutely visceral. Etched in my mind is the sensation of floating downwards from a wintery scene of a beaver pond and flowing river with scattered rocks and the stark silhouettes of trees stripped of their foliage to an underground world of entangled roots and strangely animate seeds that lie beneath the frozen ground, then sinking deeper to a place where flesh and earth mingle, rivers become veins, seeds give birth to eggs, rocks are pulsating organs, and bones turn to dust, and finally surging upwards again to encounter a kaleidoscope burst of verdant greenery. Like a vivid dream, the memory of this sensation has a clairvoyant, surrealist quality. It hovers between cognitive realm of consciousness (I was there, I experienced it) and the extra-sensory realm of the unconscious (it seemed so real that it must have happened yet the fluid shifts in time and space and seamless transformations of matter mean it must have been a dream). At the dawn of the Enlightenment, René Descartes struggled to find a method to anchor thought in the apprehension of self and banish the spectre of dreams invading perceptions of the natural world. In its twilight, the experience of immersive virtual environments such as Char Davies's loosens the moorings of Descartes' logic, setting the self adrift in uncharted waters where the demarcations of what is an illusion and what is not are no longer easily ascertained. In part, the unsettling blurring of boundaries between reality and its technological replication can be understood on a sensorial and physiological plane. By donning a stereoscope headset that envelops perception in a computer rendered realm of images, we voluntarily blind ourselves to the exterior world. Unlike cinema, in which the audience sits in darkened theater, their bodies grounded in the physical world, and watches the flickering projections of light on a screen, the enclosure of the self in a simulacrum is complete. Deprived of a tactile relationship to the outside world, one loses a perception of one's body as separate from the artificial environment it inhabits. Forest and Grid, real-time frame capture from Osmose (1995). On a metaphysical plane, the implications that arise from this entanglement of body and machine are far more indeterminate and paradoxical. For the experience of virtual reality is not only a technical process, but an imaginative and conceptual act of giving oneself over to a mimetic universe of human design. In the 1930s, Walter Benjamin, writing on the revolutionary potential of cinema to penetrate like a surgeon's hand deep into our optical unconscious, noted that a critic hostile to film complained "I can no longer think what I want to think. My thoughts have been replaced by moving images." In virtual reality, this sensation of consciousness being remodeled by technology is amplified. Dziga Vertov once wrote that in cinema one flies. In virtual reality, one becomes: becomes the cameraman, the viewer, the set, the landscape. There is no chance to run fleeing from the theatre, as did audiences when they first experienced the Brothers Lumière's train arriving at the station. Another strategy of interacting with the mimetic image must be found to avoid a psychic collision with the technological doubling of reality. As a poetic and meditative exploration of the ways in which perception and the apprehension of self are reconfigured by virtual reality, Char Davies's Ephémère is a search for such a strategy. Through an innovative use of the technological apparatus of VR, and the creation of an artificial environment that mirrors the organic world of nature, her strategy becomes a twofold process of linking the technical to the metaphysical and illusion to matter. On a sensorial and physiological plane, the blindfolding of the helmet is counterbalanced by the use of a body harness to intimately connect the corporeal act of breathing to immersion of the self within a technological realm. Whereas most virtual environments deploy a glove wired to computer sensors to create an instrumentalist relationship between perception and how one conceptually grasps virtual space, in Char Davies's Ephémère it is the subtle and involuntary life force of the body that interacts with computer code. Rather than experiencing the sensation of penetrating a mimetic realm (a literal enactment of cinematic projection analogous to Benjamin's metaphor of the surgeon's hand), one is gently suspended, floating and sinking in rhythm with the inhaling and exhaling of one's own breath. Rocks and Roots, real-time frame capture from Osmose (1995). through head-mounted display during live immersive journey/performance. While this link between the corporeality of the body and its immersion in virtual space is an essential element of Davies's work, the content of the artificial environment we temporarily inhabit is equally as salient. On a metaphysical plane, it is not only how we move but what we see in virtual space that produces a critical awareness of how our apprehension of self is altered within a mimetic universe. To experience a computer generated reality of hard-edged grids and futurist architecture, as is common in most VR environments, is to engage with a cultural paradigm that reinforces a technological will to power over nature. In contrast, both Osmose, Davies's first immersive virtual environment, and Ephémère, draw upon the natural world and the artist's background as a painter for inspiration. In her work, hard edged grids give way to muted transparencies and an atmospheric translucence in which organic forms and the nature of their simulation mirror each other in labyrinthine and unexpected ways. 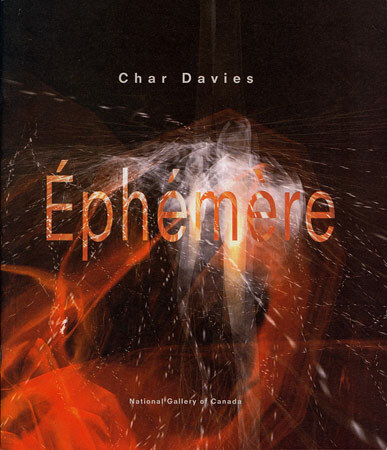 There is a moment in Char Davies's Ephémère, when sinking deep below the red-tinged earth, one encounters a technological doubling of an organic self. Passing through indeterminate layers of alluvial sediment, one finds oneself inside a highly symbolic and abstracted replication of the human body. The feeling of disorientation that occurs in virtual space and time is suddenly compounded by the realization that one has entered a mimetic image that is both self and other. What ensues from this flash of recognition is an uncanny sensation of seeing oneself seeing oneself as both flesh and machine. As if in a dream, the self is both embodied and disembodied, matter and illusion. Distinctions between mind and body melt away to reveal a place in which consciousness is no longer grounded solely in the natural world nor in its technological double, but in a dialectic between organic and synthetic realms. Instead of being able to give ourselves over to cyborg fantasies of technological control and eternal replication, we come face to face with our own mortality. Curiously, it is precisely this mirroring of the organic within virtual space that is the most controversial aspect of Davies's work. While painters such as the Group of Seven have achieved iconic status by creating representations of the woods they trod in, when Davies speaks publicly about her immersive virtual environments there is inevitably one person in the audience who asks her why she makes virtual replicas of nature when all she has to do is take a walk in the forest. The contrast that this question evokes between the mediated experience of viewing an artificial rendering of old growth trees and wildflower meadows and spring water ponds and the first hand experience of feeling the dank earth compressing underfoot and tangled branches brushing the body and the fragrance of pine needles assaulting the senses, cuts to the heart of Davies's artistic intervention in the realm of new technologies. Embedded in the question is an assumed opposition between culture and nature, yet the urge to copy nature —that is, to create a second nature through mimesis— is central to an understanding of our existence and the world we live in. The urge to copy nature finds its genesis in the earliest immersive environments of caves in which paintings on the wall animated the already lived experience of hunting prey for survival. It carries forward into shamanistic realms in which medicine men create models of the natural world through chants or herbal potions or crudely fashioned sculptures to call forth the invisible spirit world of dreams and visions. Like the return of the repressed, the mimetic urge finds its modern roots in the capacity of photography and cinema to seize hold of nature through images. In between the animistic magic of the shaman and the secular lens of the camera lies a legacy of classical Western thought extending from the Hellenic era to the Enlightenment in which both God and humanity were artisans tending gardens, creating from the chaos of the cosmos a neat and ordered relationship of nature to culture predicated upon divine design. In Char Davies's immersive virtual environments, the historical progression from "primitive" cognition of a spiritually infused nature to the ascendancy of modern science that classified, secularized and demystified a material universe is disrupted. Similar to that moment in early modernism in which Aragon, a Parisian writer, sensed a mythic flow of spirits unleashed by technology's advances, something of an ancient animism seeps through the modern lens. From the second nature that is experienced inside of Ephémère, there emerges a sense of the mysterious and the marvellous. While there is a temptation to attribute this sense of the marvellous to the transcendent role of technology, the opposite has occurred. The experience of an other worldliness in Ephémère is not dependent on machines but on our capacity to relate the reduced space of virtual reality with its defined set of computer coordinates to the infinite complexity of the natural world. For as Char Davies reminds us in the dialectic she constructs between the organic and the synthetic, the earth is a fertile site of reverie and regeneration. In contrast, virtual reality is a sterile environment that at best can offer us a glimpse of a mimetic residue of nature's vast and uncodifiable chaos. To imagine otherwise is to risk the danger of mistaking technology for divine design. Fed on a mass culture diet of video games and Gulf War precision bombings, Jurassic Park dinosaurs and Titanic spectacles, we have ingested a series of paradigms framing virtual reality that reinforce the role of technology as the trumpeting warrior, waging battle against real and perceived enemies ranging from space aliens and DNA mutations to the cataclysmic forces of natural disasters. Yet despite the Manichean fantasies that underlie the harsh clean grids of computer animation, virtual reality becomes in the popular imagination a parallel universe in which we can leave our bodies and nature behind, in which the struggle to integrate an escalating schism between nature and culture subsides. The potential of this phantasmic universe to overwhelm our desire to exist within the messy and unpredictable reality of the everyday is both the utopian impulse and the sinister endgame of new technologies. In response, Davies creates a virtual environment that disturbs ingrained attitudes in contemporary Western society towards an understanding of nature as separate from culture, and of illusion and matter as irreconcilable. To immerse the self in Ephémère is not to evade a physic collision with a technological double but to reflect upon the paradoxical and indeterminate implications that such a collision poses for how we choose to imagine and to inhabit a second nature of simulation. [1. See René Descartes. Discourse on the Method and Meditations on First Philosophy. ed. David Weissman. 2. George Duhamel quoted by Walter Benjamin in "The Work of Art in the Age of Mechanical Reproduction." Illuminations. ed. Hannah Arendt , trans. Harry Zohn. (New York: Schocken Books, 1969), p. 238. 3. Dziga Vertov's description of his cinematic experience is quoted in Paul Virilio's War and Cinema: The Logistics of Perception, trans. P. Camiller (London: Verso, 1989), p. 11. 4. Louis Aragon, "A Preface to a Modern Mythology," Paris Peasant. (London: Picador Books, 1980).